Sadly we have to report the demise of another business this week and although no-one will read about them or hear about it on the news; they are a business well known to us who have been operatingfor more than 20 years . Sadly the guys who ran the business were proper car dealers who believed in first class service and weren’t afraid to ask for a profit on the condition that the customer was happy with the car and the experience. We have known the guys for several years and their wealth of knowledge and experience when dealing with cars right across the spectrum has proved invaluable to many people and of the thousands of cars they have sold from a £500 fiesta to a £80,000 Bentley, they could count the complaints they received on the fingers of one hand. OK nothing new there you say, the motor trade is in big trouble and another trader bites the dust but why has this particular business folded? At first the reasons for its demise would seem fairly straightforward, a recession equals fewer customers trying to buy fewer cars from the same amount of dealers, it may be seen by many as a correction in the market but it’s a situation which will always produce casualties. However the reasons in this case are probably multiple and more complex. Over the years the food chain in terms of buying and selling cars has worked loosely along these lines; You have the main franchised Dealers, fleets and rental companies, car supermarkets, large independents, car leasing and sourcing companies, small local independent garages and the one man bands. 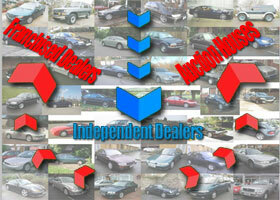 At the top the franchised dealers sell cars which generate part exchanges which are then remarketed by many of the others. Main dealers locate their stock from manufacturers, lease and rental companies and that in turn cascades down through most of the other sources. To put that a bit more clearly, in years gone by the pie was large enough for everybody to have their slice and dealer groups would have a flexible policy regarding the disposal of the non-retail stock they generated. Some cars may go to auction or be traded to other franchised dealers and smaller independents or one man band traders would build a relationship with the dealers and acquire the part exchanges to sell on to their own sources or try and retail them to the public direct. The auctions played a much smaller part in those days because many dealer groups either did not think that the service they provided offered value for money or the auction houses themselves were not equipped to support a multi franchise remarketing system. So there was a balance and the trade worked well and equitable, with most of the players quite happy with their part in the machine. The trouble really began when dealers began to realise that the ‘underwrites’ they received were not enabling them to sell as many cars as they would like and the value of a car was being decided on the opinion of very few people and these people had a vested interest in keeping that figure as low as possible in order to obtain those cars as cheaply as possible and therefore selling them much more profitably. Whilst this worked for many years, when technology improved and more car makers came to the market the overall quality, price and ultimately choice of cars also improved. This meant competition became fiercer and market share became a major factor in the car world. The knock on effect for dealers was that with more and better cars on offer everyone needed to up their game and were often having to offer improved deals to achieve the same volume of sales. The need to remain profitable however never changes but the ways that this is achieved usually does, as the current situation demonstrates with many more products on offer to increase the number of potential profit generators. There became an instant need to become a leaner business with improved processes, better people and greater cost savings plus, of course the maximisation of every opportunity, including better offers for part exchanges. This was driven by customers being able to access more and better quality information, make comparisons with other models and prices, but also by seeing at the click of a mouse what cars similar to their present vehicle were being advertised at in the ’real’ market. Many large dealers in prime city locations as little as 5 years ago were selling 200 new and used cars per month and are now selling half that due to the factors just mentioned and measures to make the smaller volumes more profitable were being explored. At about this time the major Auction groups in the UK BCA and Manheim suddenly started to get their act together. They not only significantly improved the service they offered to the dealer groups and leasing operations but they also drastically improved the service they gave to buyers. As we often report in years gone by you would barely see a ‘private’ buyer at a car auction as the perception was they would get eaten alive and would only end up with an expensive “dog” of a car with little or no comeback. Nowadays, of course the auctions have introduced greater transparency and the cars are not only thoroughly described and better presented and prepared but the buyer also has many more reasons to be confident of buying a car in this way. At the same time the marketing departments went into overdrive in an attempt to tie major dealer groups into allowing the auction centres to re-market all their trade-ins and unwanted stock in the belief that, as they were very well attended and managed, the vendors could expect much better returns than they were being offered by a handful of local traders. The current situation is that auction house’s are now attended by trade and private buyers in almost equal measure and with improved on-line auctions which will surely only grow in both quality and popularity. The auction groups are providing compelling evidence to vendors that ensure they continue to prefer them to re-market the stock as professionally and profitably as possible. Unfortunately the losers in this will inevitably be the small independent dealers like our friends and the local garages and independents who rely on their local dealer groups to provide them with their stock. Of course there is also the fact that sales mangers and staff no longer have to spend endless hours with a stream of ‘trade people’ taking up their time which could be spent selling more cars to their retail customers. Add to this the fact that when a transporter turns up to collect this week’s trade-ins in one hit valuable time and resource is saved not to mention clearing space for more cars to come in. So the smaller independents were now faced with a dilemma; if dealer groups were now using the auctions to dispose of trade-ins, where were they going to source their stock from in the future? The simple answer is they would probably have to compete with everyone else at the auction! The auctions are obviously the real winners because now any motor trader dealing in this end of the market needs to source cars in order to sell them on their own pitches which results in prices rising and margins shrinking. At the same time other buying mediums such as eBay provided another avenue for people to sell their cars privately meaning even less choice for these dealers. With private buyers gaining confidence from improved treatment at the hands of main dealers, more choice and confidence when buying from car supermarkets, auctions or eBay they often no need for the poor independent dealer caught in the middle. Basically it’s the classic military pincer movement. As the demise of our friends indicates this policy unfortunately does not discriminate against good or bad dealers. Customers will ultimately be driven by price and choice and although, like our friends, these dealers often offer a superior service and have been established for a long time they cannot compete on price and choice and therefore unfortunately will continue to become victims to the changing face of the motor trade. Rise of the auctions – should dealers be concerned? Its interesting to note what you have to say about the “Main Agent / Franchised Dealerships” ie: Sales Managers and staff no longer need to spend endless hours with a stream of “Trade” people, are they not in the trade themselves? Having been in this business for many many years the changes you quite rightly state are happening were almost inevitable, however, one thing never changes, the way Main Agent Managers and staff treat the “real Trade” in my opinion thats why some sales managers are “failed independents” very few “New Car Managers / Salesman” could ever survive if they had to go it alone and use their own money ! far better to tow the company line and have security and regular income than the autonomy and independence that comes with going it alone, its not for everyone, but for me not having to deal with the “Holy Grail” boys makes for a stress free environment, shame about your friends though, both the “Trade” and consumers need all the good ones we can get ! I agree,there are too many so called sales managers who are happy to tell you anything you want to hear when trying to sell you a ‘wrong-un’ and how much they need your help,then send everything else down the ring.I prefer going to the auction for my cars,they maybe more money but at least i get to choose what i pay more money for!!! !